…furthermore called his generals and senior field grade officers to his tent where he delivered a rousing speech, calling on them to do their duty and uphold their honour, explaining his basic plan to attack the Austrians at Breslau. The summer and autumn of 1757 were not kind to Frederick. He had been forced to abandon his invasion of Bohemia after lifting his siege of Prague and had suffered a sharp defeat at Köln, before retiring to Saxony. Moreover, he found himself with more enemies when France, Sweden and Russia all declared war against him, and without his key ally, as Britain withdrew from the war in order to preserve her territorial interests in Hanover. 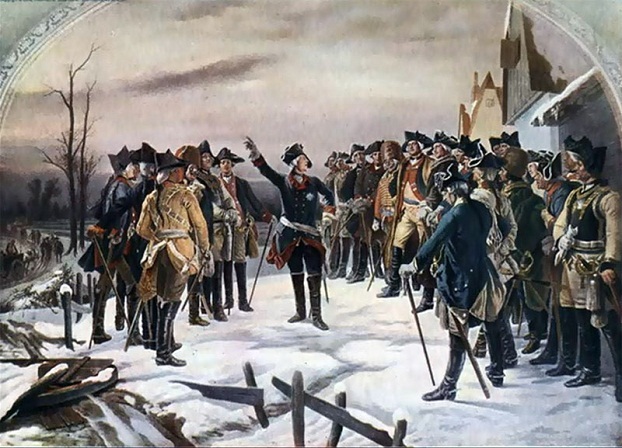 Frederick was, however, able to stabilize the situation in Saxony with a decisive victory over a large force of French and Imperial troops at Rossbach on 4 November. The victory had tremendous implications internationally, bringing Britain back into the war and with her the cash subsidies to support Prussia, and the help of her troops in northern Germany. But Frederick still had problems on his eastern flank. His forces in Silesia, the casus belli back in 1740, under the command of the duke of Bevern, were on the run. They had been defeated by an Austrian army under Charles of Lorraine and the veteran commander Field Marshal Leopold Daun outside of Breslau on 22 November and were driven back across the River Oder. Shortly thereafter Bevern himself was captured. Frederick had already begun moving to re-inforce his army in Silesia with 18 battalions of infantry and 23 squadrons of cavalry. He sent Hans von Ziethen, the commander of Prussia's hussar regiments, to keep Bevern's force together until he arrived. 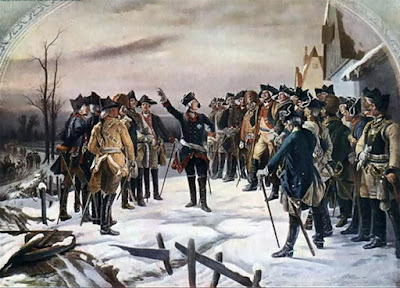 On 2 December, Frederick joined Ziethen and his troops. His original plan was to get Bevern's forces ready for combat and attack the Austrians at Breslau, but the overall strategic situation forced Frederick to move almost immediately. The stage was set for the Battle of Leuthen, which was fought just three days later. In this battle Frederick demonstrated the effectiveness of the Prussian army when led by a commander who understood its capabilities. In the course of this battle Frederick used the great manoeuvrability of his infantry to execute his oblique order of attack and to concentrate his outnumbered troops against one wing of the enemy. It also demonstrated the firepower that the well-disciplined Prussian infantry could deliver in the attack. Frederick's first task was to restore confidence to the officers and men of Bevern's command. The king strolled through the Prussian camp, talking to the troops, offering encouragement, and giving promises of rewards for merit in the action that was ahead of them. He likewise told the officers that they could redeem themselves in the battle they were about to fight. Frederick also encouraged interaction between the forces that had been defeated in Silesia and those returning from Saxony, flushed with the victory of Rossbach the previous month. Frederick hoped that the veterans of Rossbach would help raise the morale of the rest. He also took particular care to look after the comforts of his men, distributing additional rations and spirits to the troops to fortify their strength and courage. He furthermore called his generals and senior field grade officers to his tent where he delivered a rousing speech, calling on them to do their duty and uphold their honour, explaining his basic plan to attack the Austrians at Breslau. But he also promised punishments for failure, noting that cavalry regiments that failed to charge would be dismounted and downgraded to garrison service, and infantry regiments that did not press the attack would be disgraced, losing their colours, swords and having the facings cut from their uniforms. 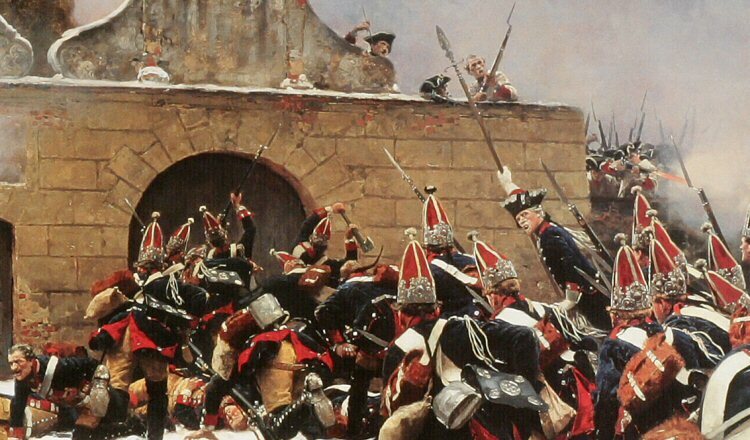 Frederick allowed his troops to rest on 3 December but the next day advanced on Breslau. While on the march Frederick learnt that the Austrians had left the city and had deployed their army around the village of Leuthen. Frederick had looked for a decisive battle to restore the situation in Silesia and was grateful to Charles and Daun for this move. The Austrians certainly had reason to be confident since they outnumbered the Prussians by nearly two to one, with great advantages in both infantry and artillery. The Austrians had some 66,000 men and more than 200 artillery pieces, compared to the Prussian's 39,000 men and 170 guns. Moreover, about two-thirds of the Prussians had been part of Bevern's force, which they had already defeated. Frederick seems mistakenly to have believed the Austrians were comparable in strength to his own forces. The Austrians were encamped along a front about five kilometres (four and a half miles) long between the small hamlets of Nippern and Sagschiitz, with the village of Leuthen behind their lines. Charles and Daun seemed ready to give Frederick an open battle, relying on their numbers to give them the victory. The Prussians made their advance to the battlefield beginning about 4 AM, and were deployed in two large infantry columns each flanked by a column of cavalry. There was also a sizeable advance guard of light infantry, including some rifle-armed Jager, and hussars led by the king himself. The action began with the Prussian advanced guard easily brushing aside a small force of Saxon dragoons and Austrian light horse, taking 200 captive. Frederick ordered these men to be paraded past the army as it advanced, to raise the morale of his troops. As Frederick viewed the long white lines of Austrian troops deployed in front of Leuthen the great size of the enemy's army became clear to him and it was plain that they had the numerical edge. But, using the coup d’oeil for which he was famous, he noted two key features of the battlefield's topography. The first was that the Austrian left had not taken advantage of some marshy ground to anchor their left flank, which was consequently left exposed, although they had hastily constructed some barricades and redoubts for their batteries there. Moreover, there was a small ridgeline that ran in front of the Austrian left, which could be used to conceal his movements in front of the Austrian left flank. Frederick quickly determined to take advantage of the vulnerable Austrian flank and to use the low ridges to mask his manoeuvre. To keep the enemy occupied, the Prussian cavalry of the left wing supported by some of the Prussian foot would feign an attack to keep the Austrian centre and right wing distracted. 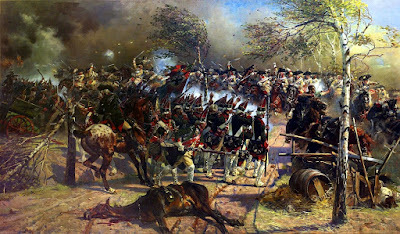 The idea of splitting an inferior force and marching a large part of it across the length of the enemy's line, all the while presenting the flank of advancing columns to musket and artillery fire, might have seemed suicidal, but because of the nature of the terrain and the speed and manoeuvrability of the Prussian infantry Frederick was willing to take the risk. By 11 AM Frederick had made his deployments, with his left-flank cavalry, supported by a small force of infantry, slowly advancing against the right flank of the Austrian line. The Austrian commander there immediately called for assistance, assuming that his flank was the object of Frederick's main assault. Charles and Daun responded by shifting their reserves to support the right, and galloped over to the right wing to oversee the engagement in person. In the meantime, the bulk of the Prussian infantry and their right-wing cavalry had begun their movement across the front of the Austrian line. The infantry, formed in two columns, moved with amazing speed due to their disciplined cadenced marching. In less than two hours they had started to form a line of battle at right-angles to the Austrian left flank, with the right-hand units extended slightly behind the Austrian line. The assault troops consisted of three excellent line infantry battalions, supported by a column of four additional battalions, three of grenadiers and one more from a crack line regiment. There were also 20 heavy twelve-pounder guns in support. The majority of the remaining Prussian infantry were deploying en echelon behind the assault force and spreading out to its left. Frederick retained 53 squadrons and six battalions in reserve. 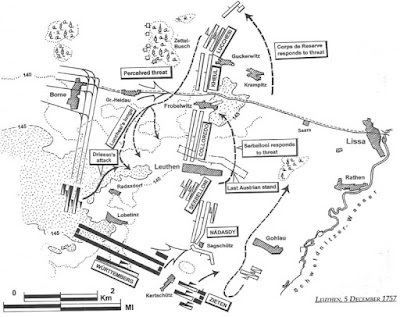 What made this manoeuvre possible was the low ridgeline that obscured the Prussians' movements. The position was strengthened by the fact that the Austrian commanders had moved over to their left flank, and so were even less likely to discern Frederick's intent. Indeed, although they noticed the Prussians moving behind the hill, they could not determine numbers or directions and assumed them to be in retreat. By 1 PM Frederick's forces were in position and ready to begin the assault. Where the Prussian attack hit the Austrian left the troops were composed mostly of soldiers of varied quality from those minor German states whose contingents were combined to form the Reichsarmee. They were under the command of General Franz Nadasdy, a bold Hungarian hussar general. The Prussians advanced on the troops of the Reichsarmee and engaged them in a fierce firefight, routing the Württembergers and pushing them back into the Bavarians, who joined in the rout. The firepower delivered by the assault troops must have been crushing - they were running out of ammunition by the time the supporting units arrived. Fortunately Frederick had brought ammunitions wagons with him. These units drew more cartridges and remained in the battle line. Nadasdy tried to restore the situation by attacking the Prussian foot with his dragoons and hussars, but he was countered by the 53 squadrons of Prussians from Frederick's reserve under the command of Ziethen. The Prussian cavalry overthrew the Austrians. Rather than pursuing the cavalry, they turned to complete the destruction of Nadasdy's broken infantry, taking over 2000 Württembergers and Bavarians prisoner. Having realized that the attack on the right was a diversion, Charles and Daun tried to turn their centre 90 degrees to face the advancing Prussians. The Austrian line was to be anchored on the village of Leuthen itself. But there was little time to plan the redeployment and units were sent in piecemeal, not properly deployed into firing lines. The manouevre was much more difficult for the Austrians, who did not manoeuvre in the closed columns of the Prussians. As they performed it they were subjected to intense Prussian musketry and the fire of 40 twelve-pounders now moved up to the high ground overlooking Leuthen. At about 3:30 the Prussian infantry began their assault against the new Austrian position. After a sharp struggle they cleared Leuthen, which had been admirably defended by a few Austrian units and a Wiirzburg regiment of Reichsarmee troops. Another Austrian cavalry charge was made but was driven back by the Prussian cavalry. At this point, the Austrian army broke. Frederick attempted a pursuit but the weather, time of day and exhaustion of his troops prevented this being very effective. 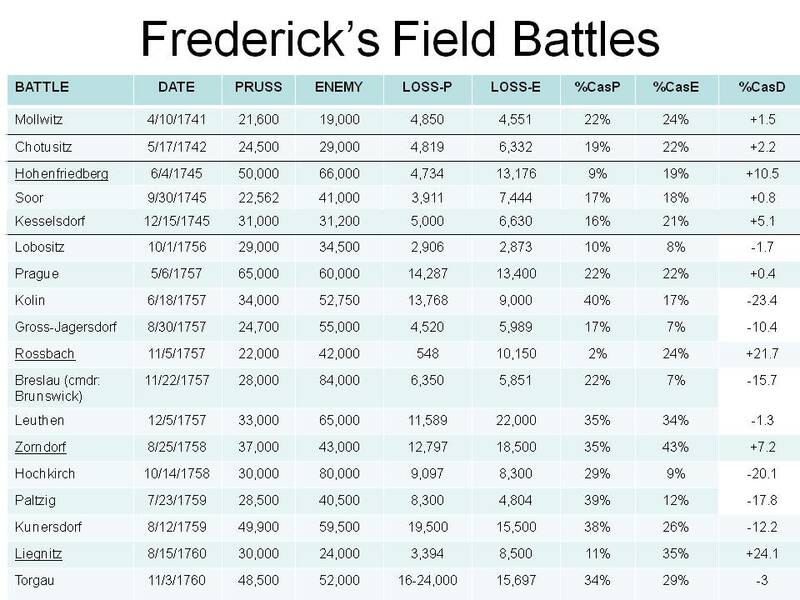 Leuthen was a great victory for Frederick but it was also a costly one. 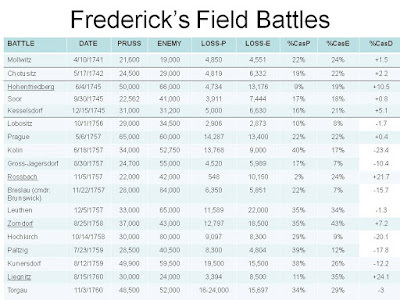 Frederick lost 6000 men, nearly one-fifth of his forces. He in turn inflicted 10,000 killed and wounded, took more than 12,000 prisoners, and captured more than 100 cannon. A further 17,000 Austrians surrendered when Breslau capitulated later in the month. Leuthen demonstrated just what could be accomplished in the age of linear warfare with an army as disciplined as that of Prussia, especially when commanded by one of the 'Great Captains' of the period.